F&F Property has a great location, with swimming pool and just beside the famous surfers' beach Playa Brava in Punta del Este. Thanks to this privileged location, you will able to enjoy the sea view and practice your surfing, while still being very close to the city centre. Is a three floor house with garden situated on a residential zone. 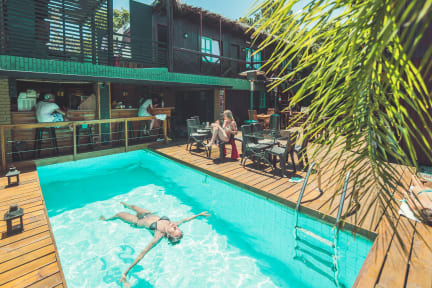 Here at the guesthouse we offer good rooms with shared facilities, common areas, pool table garden, bar, kitchen, parking, swimming pool, BBQ, surf lessons, motorbikes for rent and much more. Run by young people that keep everything clean and in order but want you to have a really chill experience without formalities. Lugar muy sociable, limpio y buen gusto con la decoración. Ideal para ir con amigas. Precioso lugar, con detalles y buena música! Super simpática la gente del lugar, me supieron orientar en todo, y pasamos buenos momentos. Hermosa pileta y terraza para disfrutar de las reposeras y la vista. Ambiente muy alegre y divertido, esperamos volver pronto, saludos! Hermoso Hostel, muy linda decoración y ambiente divertido!, repetiré pronto gracias. Hermosas vistas desde la terraza, super recomendable, todos fueron muy amables! Hermoso lugar con pileta y buena vista!